Despite what you might have read, the best acne products for adult acne don’t differ whether you’re an adult or a teenager. We know that sounds surprising, maybe even shocking, but facts are facts and there’s no research suggesting otherwise. Why some people get acne and to what degree is as much a mystery for adults as it is for teens (there are theories but nothing really 100% conclusive). However, there’s no mystery about what you can do at any age to get the problem under control and, for many, practically erase the red, white-headed bumps altogether. Quick myth-busting: Stress isn’t a differentiating factor between adult and teen acne. Teens and adults endure stress (if anything, teens suffer more because they’re still learning how to manage it) and in both cases, stress can influence the underlying causes of acne. Additionally, expecting acne products to work overnight is a big mistake many acne sufferers make. While many people will see immediate results, for others it can take at least three to four weeks to see improvement. We also can’t stress enough how important it is to use these products consistently because missing just one day can set your skin back. 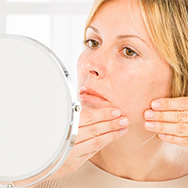 The one thing that differs for adults with acne is the other skincare challenges revolving around their desire to diminish signs of aging and, for many, large pores. You need products for those concerns, too, so it can get tricky because the anti-aging products you use must be carefully selected. Thankfully, a well formulated liquid BHA is one of the premier anti-aging products you can use. Its skin-smoothing, restorative, brightening, pore-minimizing, and youth-enhancing properties are well established. BHA is a uniquely multi-tasking super hero like no other! RESIST Advanced Kit for Normal to Oily Skin – everything you need to care for your skin every day, including sunscreen and a 4% BHA retexturing enhancer. Skin perfection from lightweight fluid textures that won’t clog pores, make skin feel heavy or greasy, or dry it out. 10% Niacinamide Booster – abundant research has established niacinamide’s pore- minimizing and skin-renewing benefits. Bonus: It enhances skin’s ability to hold on to youthful hydration. 1% Retinol Booster – the exciting anti-aging, skin-renewing qualities of retinol have been lauded for over 50 years. But what’s extra exciting is the research keeps showing retinol is even more remarkable than we ever thought it could be.